Mike Hussey produced a sparkling century before Australia's pace bowlers destroyed England's top order to push the hosts to the brink of a series-levelling victory on day three of third Ashes Test in Perth. The 35-year-old Hussey's composed 116, as his batting partners fell like dominoes, propelled Australia's second innings to 309 and set England a mammoth 391-run chase with two days to play. England lead the five-Test series 1-0 and had hoped to seal the Ashes with a win in Perth but began their chase disastrously by losing five wickets after tea to limp to 81-5. Paul Collingwood was dismissed for 11 with the last ball before stumps by Ryan Harris, the Englishman nicking an edge to all-rounder Steve Smith, who took a superb low catch in the slips. Night-watchman James Anderson (0) remained unbeaten at stumps as the last-ball wicket brought raucous cheers from home supporters on a day of brilliant sunshine at the WACA ground. England's highest successful fourth innings run chase was the 332 runs they made to beat Australia in Melbourne in 1928 and if they reached 391 in Perth it would be the fifth largest in Tests. "We've bowled as a good team, the four quicks have all stuck together and bowled in their roles and done a good job," paceman Peter Siddle said. "Hopefully we've put a little bit of damage into them at the moment after this match and see how they back it up for the next two Tests. "It's just a matter of keeping them out in the field and batting for long periods of time and really tiring them out." Pace bowler Harris struck first for the hosts, trapping England opener Alastair Cook lbw for 13 with a quick, fuller delivery before Mitchell Johnson had captain Andrew Strauss caught by Australian skipper Ricky Ponting in the slips for 15. After two days of fruitless toil, Ben Hilfenhaus clinched his first wicket in the Test by removing dangerman Kevin Pietersen for three, the South Africa-born batsman nicking to Shane Watson in the slips. "All you can do in these situations is believe," said England fast bowler Chris Tremlett, who took career-best figures of 5-87 in Australia's second innings. "It's obviously a long shot (to win) but it only takes one partnership and stranger things have happened. We'll come in tomorrow believing that we can win the game." Johnson then picked up his second wicket of the innings when he had Jonathan Trott caught behind for 31, the ball ricocheting off Ponting's hands and popping up for wicketkeeper Brad Haddin to take an easy catch. Ponting, who has had a dreadful series with the bat, injured a finger in the catch attempt. "It's clipped him on the little finger on the left hand, he's a little bit sore at the minute, but he's gone for a precautionary X-ray," Siddle said. "He's feeling upbeat, he's feeling good, (he's) just wanting to get it checked out but from all reports it seems all right." While Johnson's six-wickets helped Australia skittle England for 187 to wrest back the initiative on Friday, Hussey's brilliant form as a habitual rescuer of Australia's brittle batting line-up may prove equally telling. After pulling England quick Tremlett for four to bring up his ton, the 35-year-old celebrated wildly, bolting halfway to the Lillee Marsh stand with arms aloft in celebration. 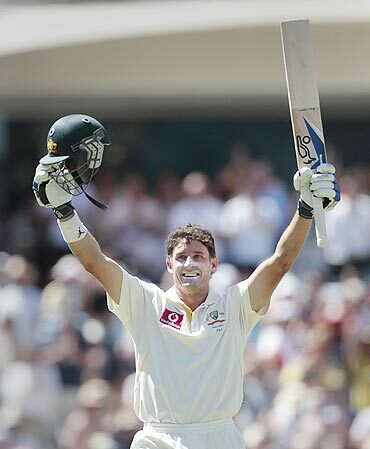 Hussey earlier resumed on 24 with opener Watson on 61 after guiding Australia to 119-3 at stumps on day two and the pair compiled an unbeaten 113-run stand before Tremlett had Watson trapped lbw five runs shy of his third Test century. Tremlett broke through again after lunch by dismissing Smith (36) early, the all-rounder gloving a catch to wicketkeeper Matt Prior, then he trapped Haddin in his crease and had him play onto his stumps for seven. 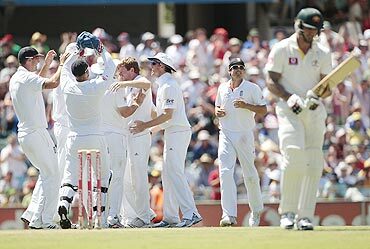 Quick bowler Johnson, who was roundly booed by English fans as he strolled out to the crease at a packed WACA ground, squandered his wicket for one when he drove an innocuous Collingwood ball straight to Ian Bell in close at short cover. 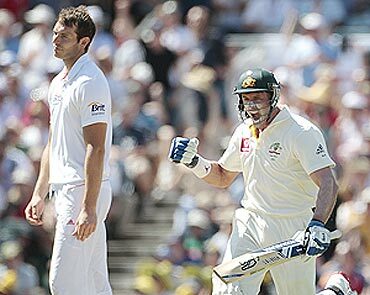 Harris, who managed a pair of ducks in the second Test at Adelaide, continued the rot by hooking a short delivery from Steve Finn high in the air where Bell took an easy catch to have the quick dismissed for one.